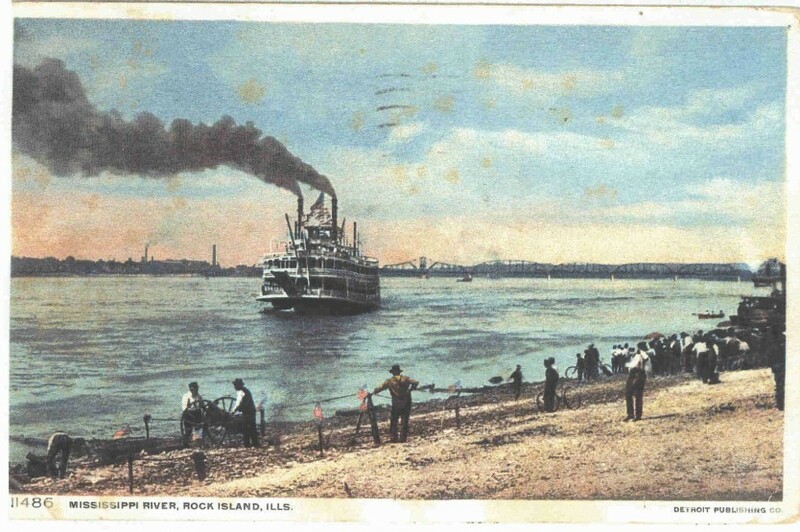 Shannon Hall’s extensive postcard collection is the source of this postcard captioned, “Mississippi River, Rock Island, Illinois.” It was created by Detroit Publishing Company, which operated from about 1895 to the mid 1930s. That company sent photographers all over the world and also bought negatives from other photographers. It published not only postcards, but also prints, souvenirs, lantern slides, and advertisements. Although called one of the major postcard publishers in America, this is the only postcard with a Rock Island subject that we have seen. Perhaps it was made from one of those purchased negatives, as a more accurate title for today’s postcard would be “Rock Island as seen from the Davenport levee.” Although most of Rock Island is only apparent as distant smokestacks, the Crescent Bridge, which was officially opened in 1900, clearly establishes the picture orientation. From the same spot today, the Centennial Bridge hides most of the Crescent. The Davenport levee is a hubbub of activity with at least two dozen people, most facing an oncoming sternwheeler spewing black smoke. Another boat, this one expelling white steam, can be glimpsed at the far right while a small rowboat plies the water between the two larger craft. Photos of the era show both the Davenport and Rock Island levees to be constructed of brick, yet the postcard clearly shows a rougher surface. Perhaps the brick landing area is just upstream, out of the photo, where the steamer is presumably headed. Some have ridden their bicycles to the levee, while an umbrella sunshade in the distant crowd indicates the presence of at least one woman. There are small flags decorating the fence posts and at the left foreground two men are maneuvering what appears to be a small cannon. Are these artifacts simply present to greet the boat or are holiday festivities about to begin? The big, industrial chimneys on the Rock Island skyline belong to the huge Rock Island Plow Company facility. Rock Island Plow had its origins in the Buford Plow works which was established in the mid 1850s. Its main investor, Charles Buford, built the magnificent house which still stands at 1804 7th Avenue in Rock Island, now owned by the Word of Life Center. Buford died in 1866, but his family continued the plow business. Buford Plow was called a strong competitor to John Deere, but an 1880 factory fire, considered by some to be arson, and a subsequent warehouse fire, forced the company into bankruptcy. Local investors reorganized the firm and named it Rock Island Plow Company. That operation continued, for a time under Weyerhaeuser ownership, until 1937, when it was sold to J. I. Case Company. Case was closed in 1987. Within the many buildings of the plow works were a multitude of different facilities, all requiring lots of power, hence the many chimneys. There were woodshops to create patterns, foundries to cast iron and alloys, and sandblasting and paint shops to finish the raw metal. There were sheet metal facilities as well, and warehouses to store the finished products. To the west of the plow works – perhaps the source of one of these chimneys – was the Rock Island Stove Company. Although its scale was much smaller than that of the plow factory, it still required similar skills. Stoves bearing the Rock Island name were shipped all over the country by river and rail. Its “Riverside” brand kitchen cookstoves and parlor baseburning and “oak” stoves were well known. That company closed about 1940. Both Rock Island Plow and Rock Island Stove symbolize the early source of prosperity for Rock Island. Heavy manufacturing industries, emitting sooty coal smoke from many smokestacks, were located in close proximity to rail lines and the river – and also adjacent to residential neighborhoods. Today, the jobs that they provided are indeed missed. But their demise also has opened our city’s riverfront to new opportunities. What will our skyline look like in another forty years? This article by Diane Oestreich is slightly modified from the original, which appeared in the Rock Island Argus and Moline Dispatch on June 5, 2005.